Includes YORK® Rubber Coated Pro Style Fixed Straight -10 Bar (20-110 lbs) Set & YORK® ETS Fixed Bar Rack. York adopted its Pro Style Dumbbell head design and applied it to our new Pro Style Fixed Straight and Curl Bars. The barbell heads are comprised of solid steel inserts fully encased in rubber. The solid steel handle passes through the steel insert and is welded permanently joining the head to the bar. Rubber coating increases durability, protects equipment, enhances appearance, diminishes noise, and is easy to clean. For home or commercial settings. Designed to work with nearly any workout program these Pro-style barbells are a great addition to any home or commercial gym. Used for presses curls and extensions these barbells are the definition of versatility. Total weight is 740 lbs. (Pro Style Fixed Curl Bars also available). Rack holds (10) Pro Style Fixed Straight Bars (Pro Style Fixed Curl Bars also available). Rack has attractive bent tubing. Commercial Quality Rack. 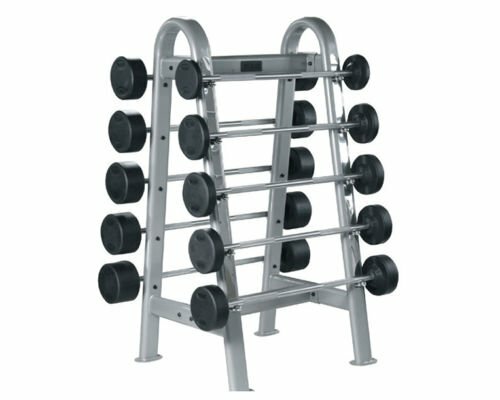 Dimensions: (W)34" x (D)33 1/2" x (H)66"
This set is a great addition to any commercial or home gym unit. By Force of Habit Barbell Company Inc.